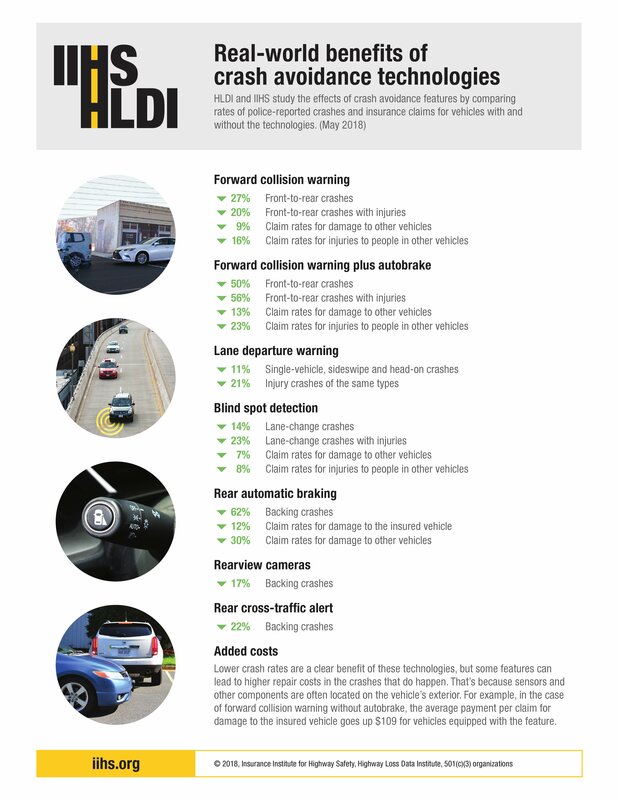 The Insurance Institute for Highway Safety has consistently been finding new vehicle technology more likely to cut collision repairers’ crash volume. However, last week, it gave body shops a little hope by reporting a shift in phone-related misbehavior by drivers. A 2018 study of Virginia motorists found 3.4 percent of them “manipulating a cellphone,” up from 2.3 percent in 2014, according to the IIHS. According to the IIHS, that makes drivers 57 percent more likely to be futzing with their phones. The study treated this statistic as a different behavior than talking on a phone and simply holding a phone; both of those activities fell compared to four years ago. Only 2.8 percent of drivers were holding a cellphone, down from 4.9 percent in 2014. 3.7 percent of drivers were caught talking on the phone, down from 4.1 percent. “The finding is consistent with research indicating that drivers are talking on hand-held phones less and fiddling with them more often than in recent years,” the IIHS wrote. However, the IIHS also pointed out that shifting from other distractions to a cellphone — and shifting to manipulation rather than talking on the phone — might be more dangerous. The AAA Foundation for Traffic Safety and the Virginia Tech Transportation Institute reported in a 2018 study that manipulating a cellphone was 66 percent more likely to pose a fatal crash threat than other “secondary behaviors,” according to the IIHS. Presumably, this makes cellphone manipulation more likely to generate nonfatal crashes too. 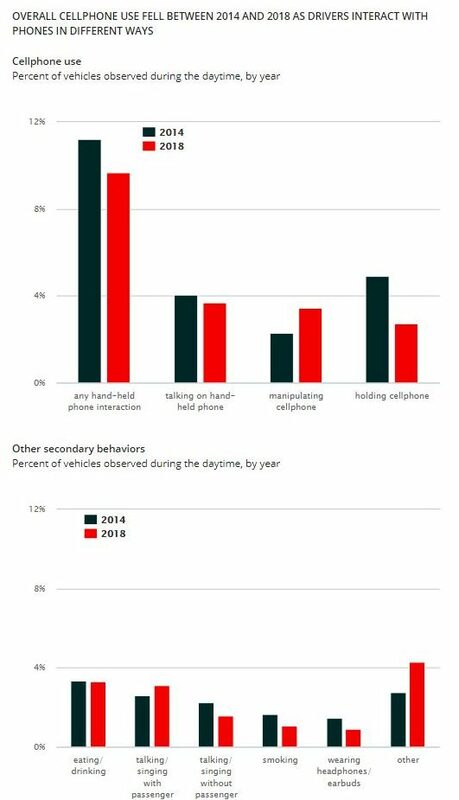 The AAA-Virginia Tech report did distinguish between talking on a phone and other behavior with it, though those researchers don’t appear to have broken out merely holding a phone like the IIHS did. Ironically, the AAA and Virginia Tech didn’t find talking on a phone was riskier at a statistically significant level. As the IIHS pointed out, the actual impact on the overall crash death toll (and potentially the overall crash rate) from this shift in behavior will be low. But at least shops have an example of technology potentially giving them more work rather than less. Ironically, the number of distraction-related crash deaths, which make up between 8-10 percent of all crash deaths, have fallen from 3,526 in 2015 to 3,166 in 2017, according to the IIHS. Crash deaths themselves fell a little in 2017 after increases in 2015 and 2016. 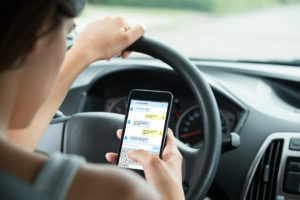 The IIHS theorizes that since tracking distraction-related deaths depends on people voluntarily handing over their phones to authorities or at least not lying about what was happening, the real number could be higher. On the other hand, there’s probably a case that a comparable proportion of people would have been dishonest and uncooperative in all three years, which might suggest that the decline still means something apples-to-apples.